1.When charging, the power switch to the OFF position, the AC plug directly into AC110/220V power outlet, the corresponding charge indicator light, said Mosquito is charging. Fully charged takes about 12 hours (AC220V 50Hz ) 24 hours (AC110V 60Hz); After charging is completed, be sure to plug the flow completely reset. 2.Mosquito control and lighting methods: the power switch to ON 1 position, press and hold the center button switches, indicator lights, then the metal surface of a high-voltage (do not touch). 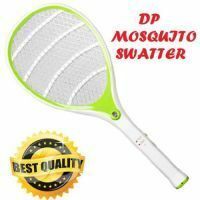 Mosquito waving clenched the handle, make contact with mosquitoes grid. After use, release the button switch, indicator light turns off power grid. When the power switch to ON 2 position, LED light bulbs light up, then mosquito control, lighting can be used simultaneously. Mosquito when not in use, unplug the power switch back to the OFF position. 3.The use of time: Full power, mosquito can be used about 10 days or so, bulbs lighting can be used continuously for about 25 hours.